Oh, hey, Judge Parker! Here’s what’s been going in Judge Parker: the police of the tropical island paradise where Marie was enjoying her honeymoon with Roy were only suggesting that she had killed him in order to flush him out of hiding, because it turned out he had embezzled a bunch of money from his employer and faked his death and now was on an entirely different resort island several thousand miles away. Obviously Marie is very broken up about this, which is why it’s extremely kind of Sam to let her fly back to the States in business class with him, right before she has to go back to cleaning his underwear and cooking him dinners that he’ll briefly acknowledge with a grunt before eating in stony silence. Oh, isn’t that cute! This hill is haunted by the ghosts of all the other children who died sledding down its steep, dangerous slopes! Look at Big Daddy Keane’s little smile: he knows. One of the things that makes it so much fun (YES, IT’S FUN, I’VE BEEN DOING IT FOR 14 YEARS AND IT’S STILL FUN, DARN IT) to analyze the soap opera strips is that the gap between what it seems like we’re supposed to believe is happening and what we actually see happening is hilariously wide. Like, so far Ian’s been winked at and less than chatty at dinner (which, you know, so has Toby). 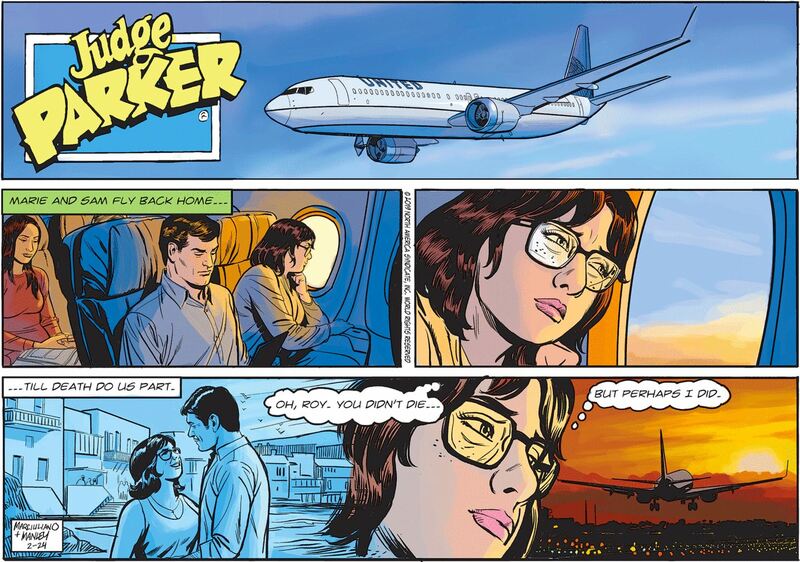 Is this what Mary Worth thinks the warning signs of an affair look like? Is this what Mary Worth thinks an affair is? Just a rash of winking-based adultery ruining marriages left and right all over this land of ours? The only way to prevent this is to make botox treatments that immobilize the whole eye area mandatory. Toby’s probably way ahead of the game! Sure, Gil talks a big game about how he doesn’t lose any sleep about how his slipshod coaching practices might negatively affect the lives of his players, but I gotta think this billboard business has him rattled. Maybe he’s starting to second-guess himself: should he have noticed that one of his student managers was dealing fake adderall to a player? Now he’s swinging wildly in the other direction and has decided that Mike Filion isn’t doing great in one of his classes and is irritating everyone with That ’70s Show quotes because he’s suicidal! I’m excited to discover that the only thing more annoying than Gil’s disinterested undercoaching is Gil’s intrusive overcoaching. CHRISTOU: Thank you, everyone. The mainstream media would have you believe that beloved Western star Roy Rogers died of congestive heart failure in 1998 in California. But the question the police force of this unnamed resort island nation would like to pose to you is: what if he didn’t? SAM: [on phone] My god, Abbey, it’s even more sick and depraved than I could’ve imagined!